Brians blog: Part scholarship for danish FOLK HIGH SCHOOL 16-19 yo. Live and learn in Denmark! Part scholarship for danish FOLK HIGH SCHOOL 16-19 yo. Live and learn in Denmark! 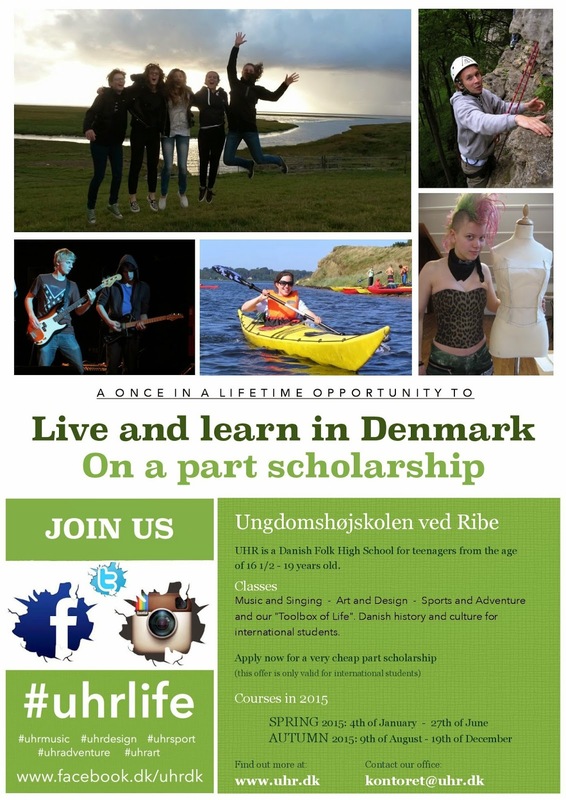 Live and learn in Denmark on a PART SCHOLARSHIP, at a FOLK HIGH SCHOOL. Live and learn with other 16 1/2 -19 yo students. Study music and singing, art and design, sports and adventure, and get the "toolbox for life". Getting you ready to find your way in education, work and you comming life. You get to live 24/7 with other students. Either in a single room or double bedroom. Take responsibility for youselfs and your co-students. There is a ZERO TOLERANCE against drugs or hash!!! Smoking only allowed outdoors (like in the rest of DK). The school is located in the marslands of south-west jutland, 8km SW of the oldest city in Denmark, (RIBE), in the little village of Vester Vedsted. Ribe is about 3hr 15min from Copenhagen by train.